Canned pumpkin is a fall baking staple, used for everything from pumpkin pancakes for breakfast and pumpkin pies for dessert. But is fresh, homemade pumpkin puree any better to bake with than canned pumpkin?Â There are a couple of reasons that canned pumpkin puree is so popular. First, it is very convenient and readily available to anyone with a well-stocked grocery store. 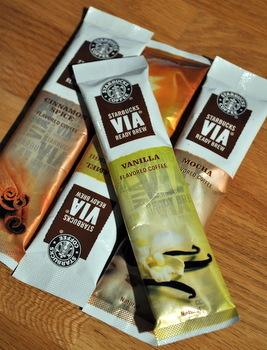 There are both regular and organic versions available and it is relatively inexpensive. The second reason is that it is consistent. Canned pumpkin puree – although there might be slight differences from brand to brand – does not vary much in its thickness, texture or flavor. Recipes usually call for pumpkin puree with the expectation that you will use canned pumpkin, and you can expect consistently good results when using it. Homemade pumpkin puree can be as good as canned, but it takes quite a bit of prep work to cook the pumpkin and puree it. Since recipes are written for canned, if you have a pumpkin that yields a puree that is too thick or too thin, you may have to adjust it (by straining or by adding in a tablespoon or two of water) to get the right consistency. Pumpkins vary widely in flavor, and homemade puree doesn’t always turn out to be as flavorful as canned (believe it or not, but I have had many bland pumpkins – even pie pumpkins!). Now that I’ve scared you off, fresh pumpkin puree can very flavorful and, if you get good quality sugar or pie pumpkins you can get a really great result that was well worth the extra effort. You just don’t get the guarantees of canned when working with fresh pumpkin and there is a risk that your pumpkin might not be up to snuff in the flavor-department. I have used both in the past and will use both in the future, but in the end, canned pumpkin is definitely easier and can be tastier than fresh pumpkin puree. I make fresh if I have a great pumpkin to start with and when I have some spare time. As long as you don’t mind all the extra prep work involved in making your own puree, it’s worth a shot, but it’s a good idea to have a can (organic, regular – any kind you like) on hand in the back of the pantry just in case. What a coincidence that you posted this today! I just posted my extremely disappointing experience making pumpkin bread with Libby’s pumpkin yesterday. I’ve made this recipe for 15 years, and it’s very reliable. But this time, it came out pale, heavy and gummy. I think the culprit was the Libby’s pumpkin. It was paler and thinner than usual. I’ve read that the season in Illinois was wetter than ideal in the early part of this season (when my pumpkin would have been grown). Although the season this year is reportedly better than last year, when they lost nearly the whole crop due to wet fields at harvest time, it still seems to me that it might not be producing the consistency of pumpkin puree that our recipes depend on. For years and year, I depended on Libby’s because they were so consistent, but this experience has me thinking of going to making my own. At least where I live, the pumpkins crop seems to be good, and the fields have been hot and dry, just the way they like them. I’d be interested in others experience with this year’s crop of pumpkin in a can. There are other issues to consider as well, such as buying locally produced food and concern over BPA in canned goods. i always wondered if making pumpkin puree from scratch was worth all the effort… thanks for this post! Actually, fresh pumpkin puree can be a bit of work, but if you add the right spices and brown sugar you can get a flavor that beats canned hands down. Try using Mexican brown sugar found in solid cones called Piloncillo. Depending on the size of your pumpkin 2-3 cones simmered in the pumpkin puree along with some cinnamon, and ground ginger can make even the most bland pumpkin pretty flavorful and sweet. are they interchangeable? the pie filling and regular canned pumpkin ? and if not, what would you suggest to do in canned-pumpkin-starved baltimore? i agree, especially if you are using pumpkin all of the time!! My family has used our own pumpkin exclusively for the last four years. It helps that we have the space to grow our own, but for those who want to give it a try, we buy seed for the variety called ‘Cinderella’, which is consistently marvelous. We halve the ripe pumpkins, scoop out the seeds and lay them on a baking sheet, baking until tender. Then we scoop out the flesh and put it through a food mill. There is not a lot of fiber in the Cinderella pumpkins, so this doesn’t take too long. If it’s a little thin we just put it on the stove top to cook it down. We’ve never experienced a bad flavor this way, in fact I’d eat this over the canned in a pie any day… canned pumpkin pie has something about it that requires being smothered in whipped cream, whereas home grown I eat plain. I agree with Valerie. Roasting pumpkin (Cinderella, Long Island Cheese or my favorite Musquee de Provence) and pureeing it cannot compare to canned pumpkin. Roasting at a high temp, dries it slightly, concentrates the sugars, and I even let my pumpkin get a little burned on the edges. I make many pumpkin pies every fall and sell them around Thanksgiving and people say it is the best they’ve ever had. did the canned pumpkin companies of the world put you up to this? i seriously ask cause last year i made a pie with pumpkin puree and it was awesome and the recipes i read said there was little to no difference, except that you wanna watch how much liquid you add. if you have any desire to make your own, DO IT!! give it a try. be adventurous. test something out for yourself and don’t rely on what someone else says. Great advice, Valerie! I like roasting fresh pumpkin before I use it, too. Growing your own always seems to make things taste better, too! For the first time ever, I make my home pumpkin puree. I have to say, that I absolutely LOVED it, and LOVE the end result. I love pumpkin, and stock up on canned pumpkin so I can have it year round. This year I bought a ton of canned, and made a ton of my own and have freezed it. I truly do think it is worth the effort, but to each their own. Still a great post! I totally agree – after making my own pumpkin puree, I was disappointed to find out that the flavor was not as bold in my pie (same recipe) as my mom’s pie made with organic canned pumpkin. I will from now on use the canned version. I use a pumpkin/squash called a Long Island Cheese Squash. Not only does it have the best flavor ever, but it is low in moisture. All you need to do is bake it just like any winter squash, then remove from the skin and puree it. 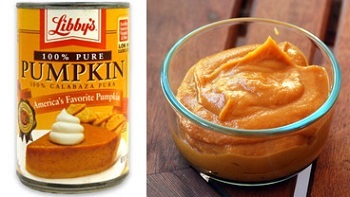 Very simple and I promise it will make the best pumpkin pie ever! I’ve always wanted to use home grown home made pumpkin but those little orange pumpkins (even called pie pumpkins) just don’t cut it! There is a white/gray pumpkin/squash with the brightest orange flesh and the most incredibly sweet flavor that is worth using. Now if only I can find seeds (and a name) for it! I just made a pie with my own puree, only instead of using pumpkin I used butternut squash. It was delicious and tasted just as good or better than canned pumpkin. Maybe this makes me a baking snob, but just knowing that I made everything myself makes it taste better. Not to mention, baking a squash and pureeing it in a blender is super easy and can be cheaper than canned, especially if you get a big squash and freeze the extra for later. We grew pumpkins this year and just harvested 12 pumpkins. I have no idea what variety — we got the plants from Home Depot. Yesterday I made puree from the first pumpkin, but it is more yellow than orange and is so bland it doesn’t look, smell or taste like the Libby’s pumpkin I am used to from a can. I made 2 pies today combining approx 1 3/4 cups of the homemade puree (thick, yellow, bland) with 1 3/4 cups of canned organic pumpkin (thinner, very orange and with a very strong pumpkin smell) — using the recipe from the Libby’s can. The resulting pumpkin flavor was great. . . not too bland or too strong. But my QUESTION is: How can I put flavor into the bland homemade puree without having to combine it with canned pumpkin? How about adding PUMPKIN PIE SPICE? Would that work? Well as far as being bland, you need sugar pumpkins for a sweeter taste, or strain all the water out if you are recycling jackolangers. I love fresh, but my Dad has not been too enthusiastic about it, since I made one bad one where I didn’t strain the water out, because that makes a difference, especially if it is a jackolanter pumpkin, as those are not really ideal for pie. A good idea might be to make your jackolanters with sugar pumpkins. I love canned, but I really love fresh, if done right. Even the time I didn’t strain it, I felt it has a nice sweet taste. The reason I think sometimes fresh could be bland is because when you use watery less sweet pumpkins, it tends not to be as sweet. My Dad grows pumpkins and some come off the vine before ripe; although they are great for jackolanters, after halloween is over, I try to make them into pies and they tend to be harder and don’t melt. Somebody told me you could make the unripe ones like you would apple, cutting it into pieces and cooking it on the stove, then put in a pie. I love fresh pumpkin and I found an easy way to make and freeze it. Please check out thehappyhousewife.com. It doesn’t get easier then this, toss it in prior to bedtime and wake up with a nice smelling house. I have made many pumpkin pies from scratch and from canned. The pumpkin pies from scratch have always been much better than the canned. Until this year. I baked the pumpkins, etc and made the pies. They were good, but the flavor was just not there. I have come to the conclusion, that if the pumpkin doesn’t have the best flavor, your pie will not be as good as canned. After the disappointing taste of the from scratch pumpkin pie, I will now only use the canned pumpkin. It is a lot of work to make the pies from scratch and not being sure that the taste will be that great, I have decided to go to the canned from now on. Thanks for all of the information. I will try the pumpkin squash. We too utilize the puree form Musque du Provence variety of squash in all pumpkin baking recipes. We also eat it in thin slices fresh because it has such immense flavor. Almost like a watermelon sweetness. One vine yields only a few pumpkins, but it still far more than our family needs for the entire winter once it is all baked, pureed and frozen. Thanks for the recipe and making a place for this discussion! !